New York City has long been a major economic, political and cultural hub of the United States. 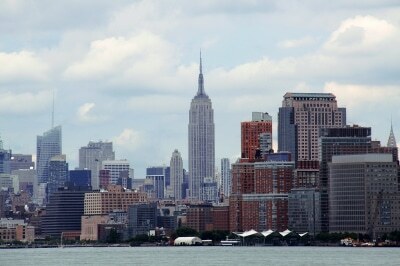 Its five boroughs were created largely due to the mass influx of immigrants in the late 19th and early 20th centuries. As such, the city remains today one of the most densely populated metropolises in the country, and it is also home to some of the most stunning pieces of architecture across the globe. These buildings have a rich history and are considered by many to be the defining features of NYC at large. Though the world has seen the rise of a number of skyscrapers, many of which have surpassed those found in New York in terms of height and grandeur, there is no doubting the mark those located in “The City” have left on the world. Empire State Building – the concrete construction on this 103 story skyscraper was completed in 1931 and from that time onward to 1970 it held the title for being the tallest structure in the world. The maximum height is 1,454 feet at the peak; after the wake of 9/11 and the subsequent collapse of the World Trade Center towers, it remained the tallest building in NYC until the construction of the Freedom Tower. The construction process began in January of 1930 and was formally initiated on St. Patrick’s Day. The bulk of the labor force consisted of European and Canadian immigrants. Amazingly enough even by today’s building standards, the skyscraper was completed in just over a year. The bulk of the stories (up to the 85th floor) consist of various office spaces, while the top floors comprise the Art Deco tower. An observation deck at the top makes for stunning views. The exterior was built from limestone panels, which give it a unique architectural design. The Statue of Liberty – the iconic symbol of American freedom and values is a work of architectural genius and one of the country’s foremost national monuments. Lady Liberty was received as a gift from France in 1886 (designed by French architect Frederic Auguste Bartholdi) and has the text of the U.S. Declaration of Independence inscribed on its massive stone book. There have been many restoration projects performed on the statue due to surface erosion and damage by hurricanes. Though the original balcony encircling the torch still stands, it has been closed to public access since 1916 for safety reasons. All of the construction occurred in France; the statue is 151 feet in height and its exterior is made from multiple 2.4 mm copper sheets. Chrysler Building – built in 1930, this 77 floor skyscraper has a maximum height at just over 1,000 feet. It was created on a steel frame with the exterior material being brick. The construction process took 1 ½ years to complete; the building was finalized in May of 1930. It houses many commercial office spaces and has an observation deck near the top. The Trump Building – Comparable in size to the Chrysler, this one is just a shy smaller. Its height is 927 feet, it has 70 floors, and interestingly enough was also built in 1930. The building is widely considered a financial hub of Wall Street. The steel frame and brick façade were commonly used construction materials during these times, due to their durability. Rockefeller Center – Since its inception in 1933 (a two year construction project), the GE Building has been a popular landmark in the city. Located in Manhattan, it consists of commercial offices and numerous retail shops. It has a limestone façade on top of its steel frame. It stands 850 feet tall and contains 69 floors.